QUESTION: Sir; Will the Fed start to print money again if the economy turns down and does this not cause gold to rise? ANSWER: No. The gold promoters constantly tout inflation, stating that the rise in money supply must lead to higher gold prices. If you simply correlate gold prices to the money supply, you will discover that this is total propaganda. 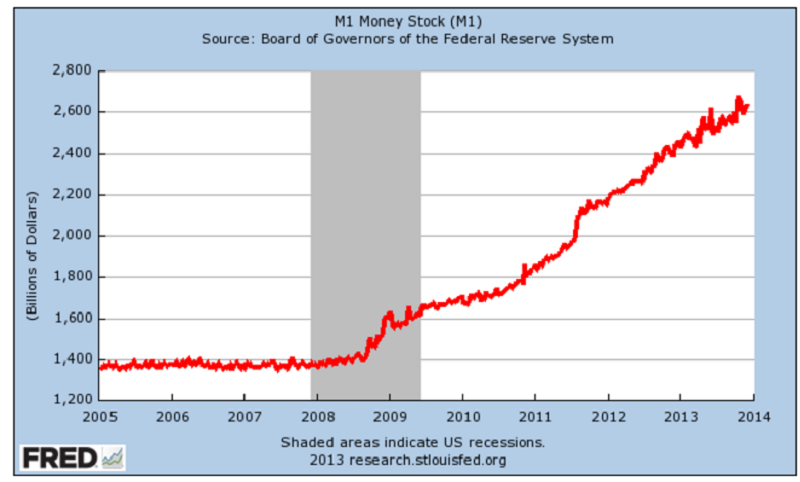 Just look at the last few years alone: gold peaked in 2011 and the money supply continued to rise. There is zero truth to the propaganda and those who believe it will end up losing everything. It should be criminal. If you are going to sell medicine, you cannot claim something will grow hair when it will not or reverse the aging process when it will not. You would go to prison for consumer fraud, but this is not the case when it comes to precious metals. One day, a lot of these people will end up in jail for consumer fraud. There is no correlation between gold and inflation any more than there is with most commodities. We have the largest database in the world. If such a relationship existed, we would be shouting it from the rooftop. The commodities business is highly cyclical; boom and bust is par for the course. Yet, these promoters bury people alive by telling them that there is no cycle and it is always up, up, and away. There is a time to buy and there is always a time to sell. It’s Just Time.